The Feldenkrais Method can be experienced in two ways: in group classes known as Awareness Through Movement Classes or in an individual session called Functional Integration. A typical Awareness Through Movement class will last for about an hour and the Feldenkrais Practitioner will lead participants through a sequence of slow and gentle movements. Most classes take place on a mat on the floor but occasionally may be sitting on the floor or a chair. The movements are designed to encourage students to explore their own movement in details to increase awareness and explore new possibilities. There are no specific goals to aim for and every student is encouraged to go at their own pace a to keep within their comfortable range of movement for an enjoyable experience. Functional Integration sessions use similar movement sequences but the Practitioner will make the movements for the student – usually lying or sitting, fully clothed, on a low padded table. The student is encouraged to notice the sensations of movement they feel and this is related to real life functions such as sitting, standing and walking with improved ease. Everyone can benefit from Feldenkrais lessons through increased awareness of ourselves and the way we move, the habits we have acquired and the potential for improvement. and for those engaged in the performing arts – many musicians, dancers, actors and singers have benefited in their professional and personal lives from The Feldenkrais Method. 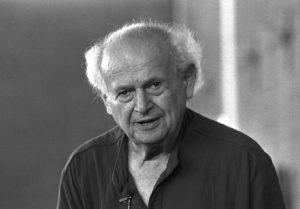 Moshe Feldenkrais developed his unique system of somatic education over many years following his own traumatic knee injury. He worked in France, UK, Israel and USA creating and teaching his approach. An exceptionally gifted individual, Moshe drew on his background in martial arts (a judo black belt), engineering and physics to ‘deconstruct’ the way we humans use our mind and body in movement and then to ‘construct’ countless lessons made up of sequences of movement to enable everyone to re-discover easy, efficient and enjoyable movement. The movements he taught are designed to improve everyday functioning – in sitting, standing, lying and walking. Moshe’s great insight was to see mind and body as inseparable – he recognised that movement begins in the brain and that the brain can be changed through feedback from movement. The key to this change he saw as awareness: he saw that tiny babies teach themselves to lift their heads, sit, crawl, stand and walk through trial and error and that as adults we can continue to learn by paying attention to the movements we make and exercising choice. “If you know what you are doing, you can do what you want”. Norman Doidge: The Brain’s Way of Healing. Allen Lane, 2015. Chap 5: Moshe Feldenkrais: Physicist, Black Belt and Healer.